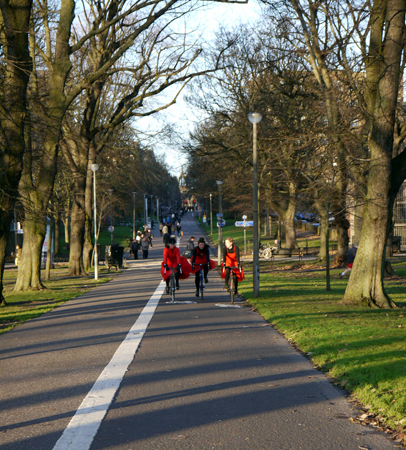 The French word flâneur (pronounced: [flɑnœʁ]) dates back to the 16th or 17th century, meaning strolling or idling. During the 19th century, philosophers and writers explored its interpretations and the word became associated with different connotations: exploring, leisure, curiosity as well as laziness. 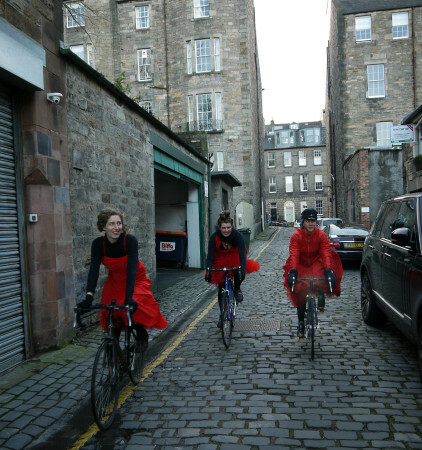 Over the decades the term flâneur has been used to critically investigate and understand our relationship within the city landscape and our participation within it. 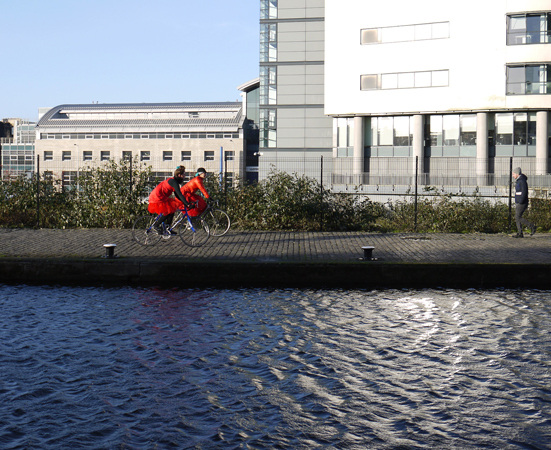 Cycle Flâneur uses the urban fabric and pattern as it’s stage and background. 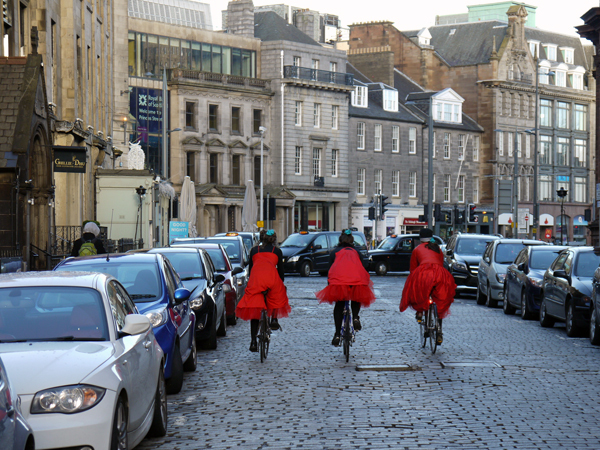 Three women in red dresses on road bikes cycle through the streets: to see as well as to be seen. 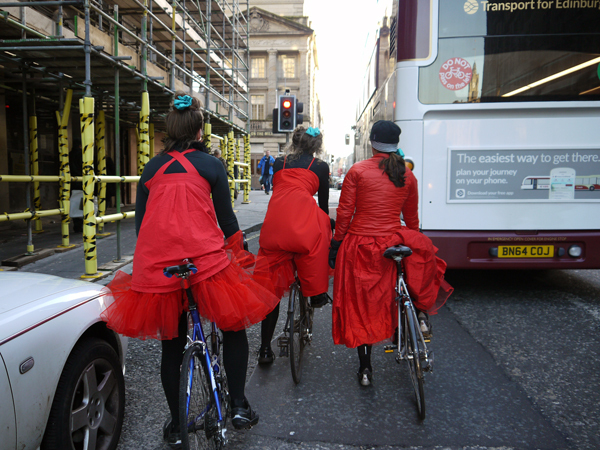 On road bikes they become part of the movement of the city; flowing with the traffic, stopping to let pedestrians cross. 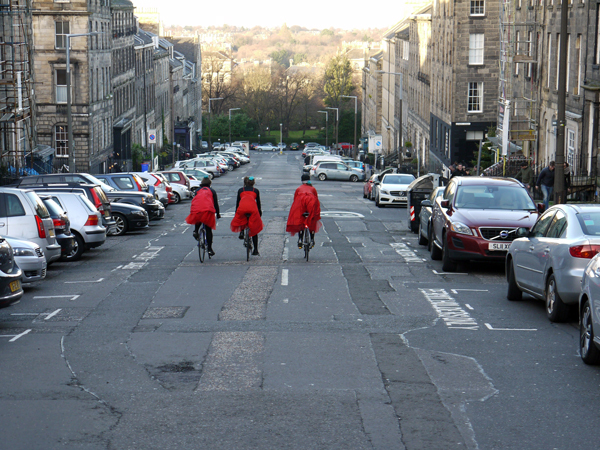 At the same time they are being marginalised, squeezed between road and pavement; too delicate for the motorised traffic, too fast for the pedestrians. 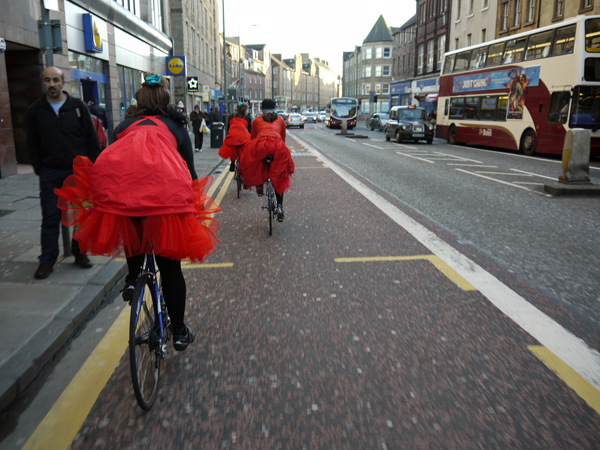 Cycle Flâneur with its flamboyant red dresses stands in juxtaposition to the more commonly seen lycra attired cyclist. 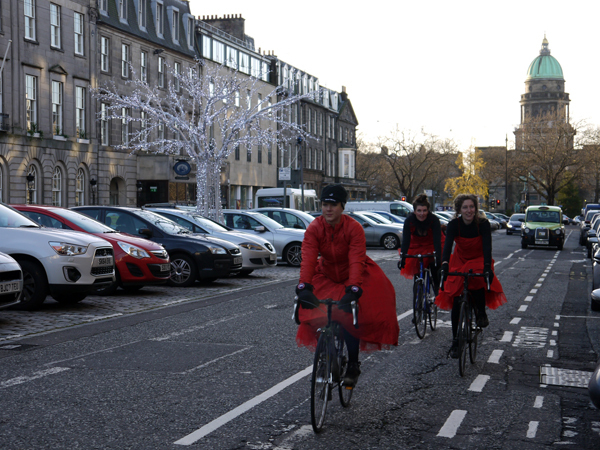 Although it is slowly changing, in Edinburgh it is fairly uncommon to see cyclists dressed up for work or a night out. 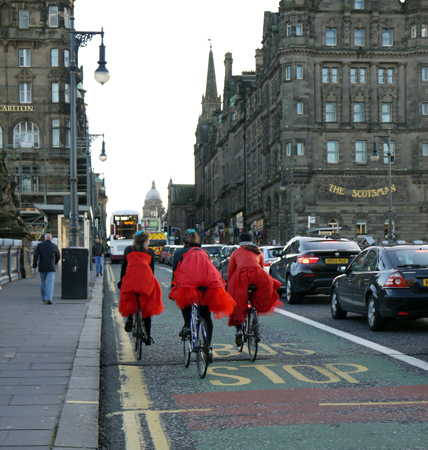 The lycra attired cyclist still seems to be the norm. 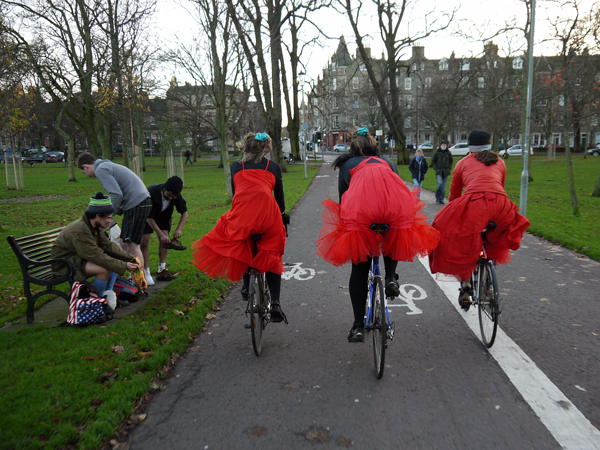 Cycle Flâneur explores where we belong and fit within the urban open public spaces, how we move within them and participate in. 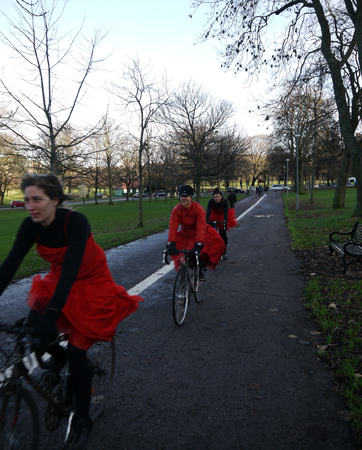 As the flâneur is usually portrayed as a male identity and the existence of a female version, the flâneuse, debatable, this performance highlights the female presence within our urban spaces, specifically as cyclists. 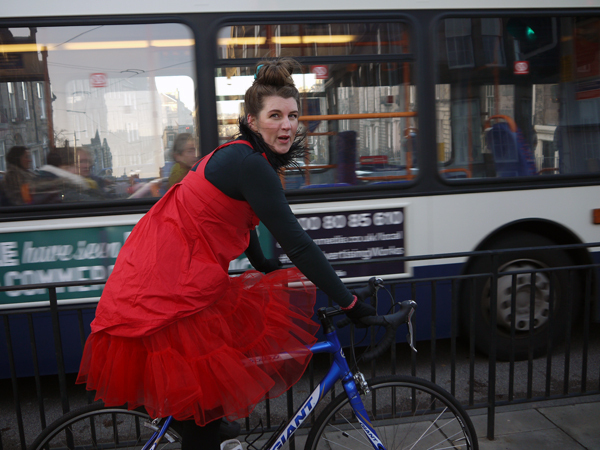 It also questions the appropriateness of clothing within the public realm when associated with specific activities such as cycling. 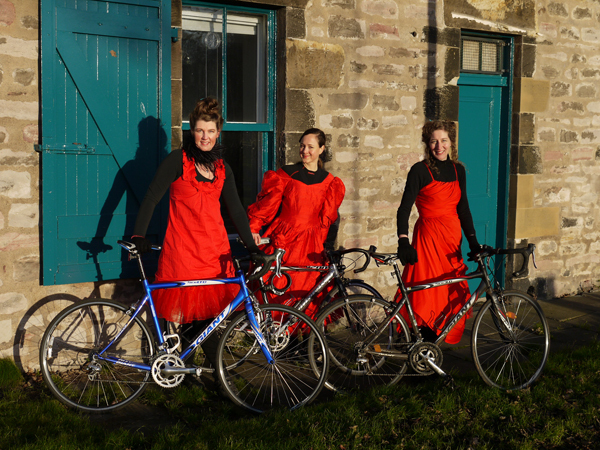 Nevertheless as a live performance it is also to be enjoyed, to watch something of beauty and to bring a smile to peoples faces (we saw many! ).